Deficiency chronic energy is the condition those where pregnant women experience food shortages that occur as a year (Chronis). To be marking by size LILA <23,5 cm. Overall for survey results Riskesdas in 2017 and Riskesdas in 2013 that is 21,6% increased to be 24.2%, while Riskesdas Riau Province in 2013 that’s showing the risk prevalence KEK of Bengkalis Regency that is (66, 4%). The purpose of this study to knows the connection of knowledge about nutrition, energy intake, abstinence, education, parity and age. 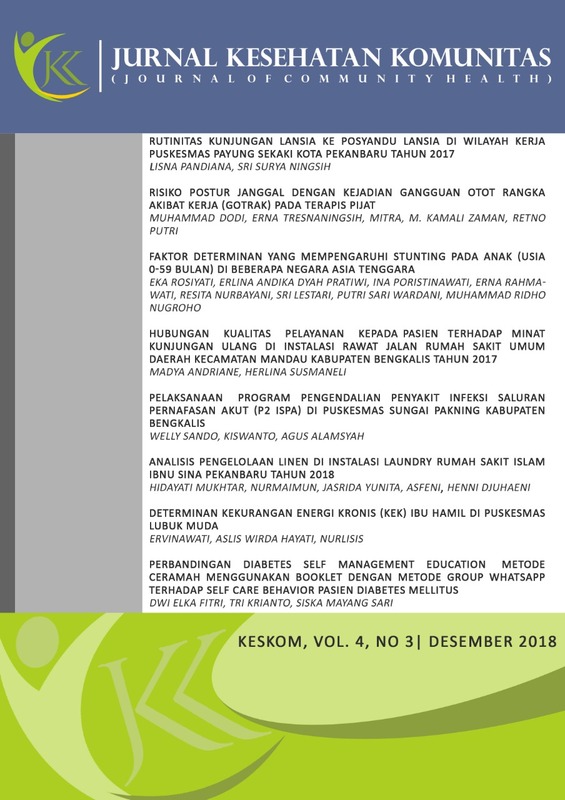 Is it associated with chronic energy deficiency (KEK) Pregnant Women in the Work Area of ​​Lububuk Muda Public Health Center Siak Kecil District Bengkalis Regency in 2017. Analytical quantitative research type with Cross Sectional design, sample number of 117 pregnant mother. Measuring instrument using questioner, KEK is measured using Upper Arm Ribbon and Recall Energy intake 2x24 hours measured using Nury Suvey program. Data analysis was performed univariat, bivariate (chi-square) and multivariate (multiple logistic regression). The results showed that there was a causal relationship between parity with happening on KEK to pregnant mother of POR: 9,937 (CI 95 % :4,206-23,481). To the manager of KIA program collaborate with cross sectors to move the family planning program by re-sosializing to get an ideal number of families.